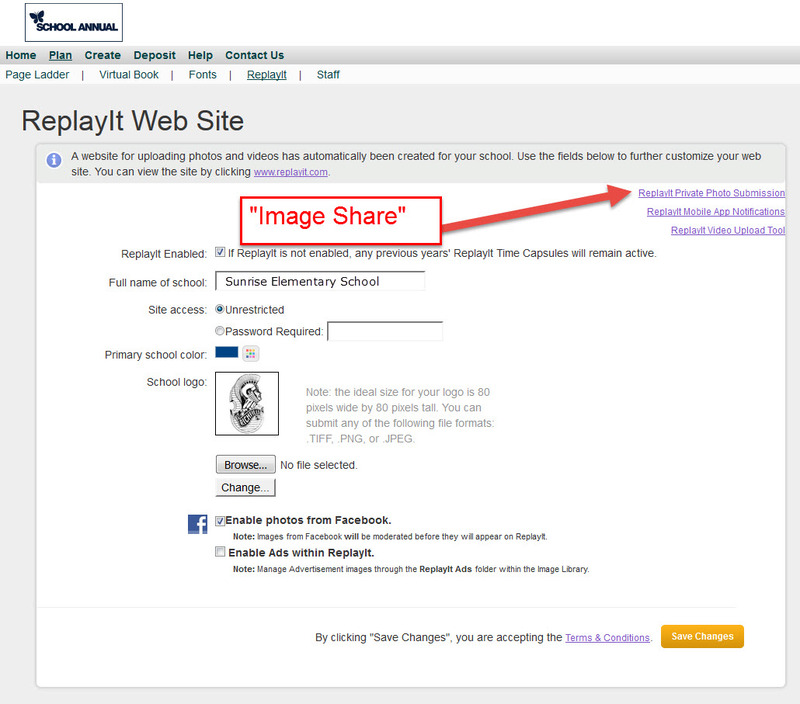 ReplayIt Private Photo Submission is a tool that allows the completely private upload of images from people who are not part of your yearbook staff. On the Plan menu, click ReplayIt. Navigate to the ReplayIt Private Photo Sharing Tool. If you've been with us "forever", you'll know this tool as Image Share. Fill in the requested information and click Save. When the information is saved, a link is generated and a suggested email containing the link with user ID is displayed. Copy and paste the information into your own email client or document. You can email or print and distribute this. Customize the email to suit your needs. For example, your email could describe the content of photos you're looking for or provide information about how to create an ad. Why isn't my site working? Check your start and end dates. If you want "test" your upload, your start date must be at least TODAY's date. The images must be .jpg, .png, or .tif files and must be at least 300ppi resolution. Include the date range for image collection. Include the link and the User ID for Image Share. You can copy the link ABOVE the save button to have the User ID embedded directly. Include YOUR contact information if a parent has questions about content. FIRST NAME and LAST NAME on the image line should only be that of the main student featured in the image (or the left-most person). Additional names should be placed in the DESCRIPTION separated by commas. You'll be able to copy and paste this information into the People tab in the Image Library so that other students are tagged. GRADE should either be N/A or should be the child's CURRENT GRADE. DESCRIPTION is used for anything else the parent needs to provide, like additional names of students in the photo, the grade the student was in when the picture was taken, etc. You may want to allow an extra week of cushion time in your "end date", but not advertise it. We receive frequent support emails that parents cannot log in and usually the site has expired the day before! If parents can't upload anymore photos you will need to empty images from the Inbox ReplayIt folder to free up more image slots. 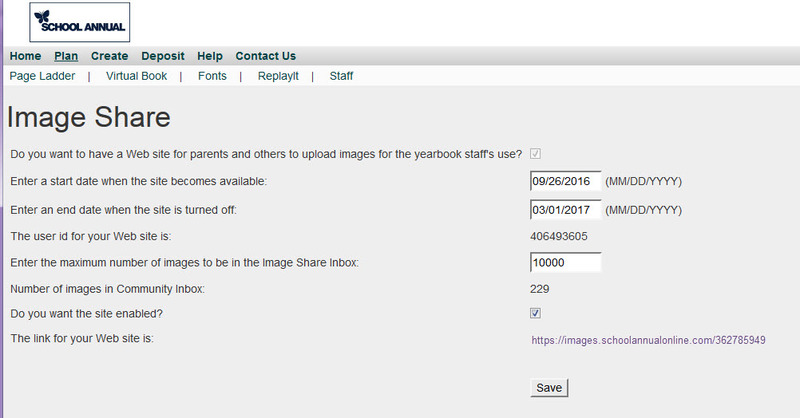 School Annual Support will not change dates or add more photo capacity to the Image Share Inbox without the Adviser's permission.